Road signs warning of buggies are ubiquitous in Amish areas. This is the first time I’ve seen one alerting drivers of an Amish funeral ahead. This sign was spotted on an Indiana backroad. As you’d expect, funerals can be heavily-attended occasions, among the largest events held at Amish homes. Another time to stay particularly alert is on Sunday morning when Amish travel to church services, and later in the day when Amish youth are traveling to their groups and singings. This can mean a swarm of buggy traffic, especially in larger communities with many churches and with youth sometimes traveling cross-settlement to their groups or dates. The sign could probably use a little punctuation (it reminded me of the confusing SLOW CHILDREN PLAYING signs you often see in suburban neighborhoods). 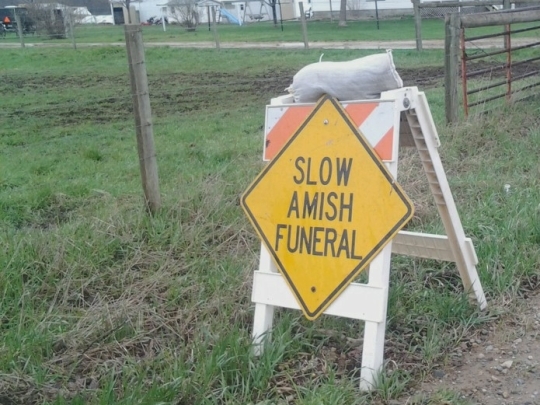 S L O W . . .
Well, to be fair, Amish funerals are kind of slow! Quiet death in family also. I just think that we as a society all need to learn to respect each other’s religious beliefs. If someone goes off the deep end and goes radical–some kind of intervention is needed. But if Amish use mainly back roads then folks using them need to use caution. Some Englischers like to try to spook the horses they get a kick out of seeing a rider tossed. This happened to me years ago. My dad was way beyond furious. He told me next time to get the license plate. He was a lawyer and no one was going to mess with his daughter like that! Or drivers are so busy yakking on their cell phones that the thought of slowing down just doesn’t enter their minds. I was in Lancaster several years ago and a buggy pulled up long side me at a red light. I told the kids they had a beautiful horse. They just kind of looked at me like I was odd. So I spoke to the horse. I kept talking to him. He finally turned his head all the way around to see who this person was! I’m like “hi there”! Poor horse just wanted to see the friendly face to put with the voice. I’m not saying Amish should have their roads nd everyone else has theirs. In a way it would be good. That way Englischers would know there on an Amish road and should act accordingly. But there are always going to be a few rotten apples. Maybe a way to make this work better is to have someone from the Amish community who cn get access to license plates. Then they can go to the home to talk with the family. Not in anger. But in a spirit of communal living. We all live on this planet and somehow we have to make this work. Oh, I hope you don’t get mad at me! I just wanted to say something but I’m afraid it will sound harsh, and I so don’t mean to! In general I just don’t think it’s a good idea to talk to the buggy horses when they’re out on the road that way. I mean, if their driver says “good girl” or whatever I think that would be good! But for someone the horse doesn’t know, especially in a car, I’d think it could distract the horse from her or his work. I don’t know perhaps I’m thinking too much of the rule that generally one isn’t supposed to distract a guide dog or service dog while working. I just think if it were me driving, especially if the horse was younger and not quite so steady yet, I would get nervous having people in cars talking to my horse and distracting him. I am so glad you’re OK from the fall you took when people intentionally spooked your horse. That is awful! And I wonder how old the kids were? Maybe they were too young and hadn’t yet learned English, or maybe just shy. Very well said Margaret. I love the way you think. Wish everyone felt the same way. Everyone no matter what the religion is or the way they live should be shown respect. I agree with Margaret, we all need to respect each other. Seriously though, I agree that we all need to be more respectful of one another. I have never come across this sign, but if I did, I would give it all the respect it deserves. We have to share our roads. Thank you, and as always, I greatly enjoy reading your blog! Reminds me of the time my brother got a ticket for passing a line of buggies which turned out to be part of a funeral procession…there were 17, it turned out, and the law at the time (may still be for all I know) was that one could legally pass no more than 11 wheeled vehicles in a row. So even though he was unaware of how many there were and passed them all very slowly, cop pulled out from behind a hedge and he got nailed. So that sign might well be taken as a reason for dual cautions: safety and ticket! It is a good idea to put up as when you come up behind them you can’t see past the one in front of you to see how many there are up there. “Slow, Amish Funeral”. The most recent time was last summer. Road (#900E), the traffic on the road was stopped. Down the road there was a long procession of buggies crossing 900 E on the crossroad 500 N. I assume that the funeral was at a farm east of 900 E and the cemetery was west of 900 E. We had to wait about 10 minutes until all of the buggies crossed. I wish I’d counted them; there must have been at least 50 buggies. I’ve never seen the walking procession like in your first photo Jodi. Thanks for sharing that.